The new products will officially be available on the MFT online store on August 8th at 9:00 pm EST (= Europe: August 9th at 3:00 am CET). Most of the supplies I used for this project are linked in the list at the bottom of this post. I created a selfmade "glow" that comes out of the magic wand. I cut out a random shape with a cutter from masking paper and used the negative part as a stencil. I sponged Distress inks over it to create a magical rainbow trail. I glued some tiny stars for more interest. I colored the bear magician with Copic markers, cut it out with scissors and adhered it to the background with foam pads for more dimension. The shadow is from the Oval Shadows Die-namics and was die-cut from Steel Grey cardstock. I added Wink of Stella clear shimmer to the stars, the hat and the rainbow sweater. You are so clever, Francine! Your self-made 'Glow' is genius and takes this card to the next level! This card is absolutely, positively ADORABLE and I love it to pieces!!! 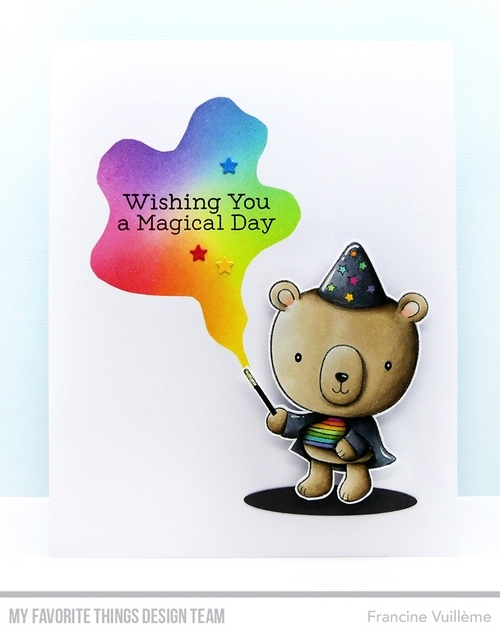 Super cute wizzard bear!Sweet and simple card!Love it! Your magician is magical with his rainbows! Awesome card! Love the way the "glow" turned out. 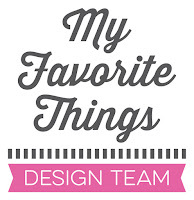 Fabulous design Francine, love the magical glow very clever! TFS! I really love the coloring of this bear. Thank you for sharing. Very cute bear magician. Great coloring.